The intergalactic war of Ironclad Games' real-time strategy game Sins of a Solar Empire has gone on too long, prompting the game's third expansion, Rebellion, packed with new tech and ships capable of destroying entire fleets all by their lonesome. Diplomacy is no longer an option in Sins of a Solar Empire: Rebellion. Sub-factions have risen up, giving players of the space-faring strategy game a choice: Stand with the Loyalists, or join the Rebels striving to bring about change. Either choice leads to new tech trees unlocking powerful technology and ship variants to further the war that continues with or without the internal struggle. New features of Sins of a Solar Empire: Rebellion include massive Titan-class ships that eat other ships for breakfast, new Corvette and Capital ships, Loyalist and Rebel versions of some of the game's existing rides, and enhanced capabilities for those ships, giving players more strategic options. The expansion will also upgrade lighting and particle effects, while integrating support for Stardock's Impulse::Reactor service, allowing players to chat with friends and unlock achievements. Ooo. 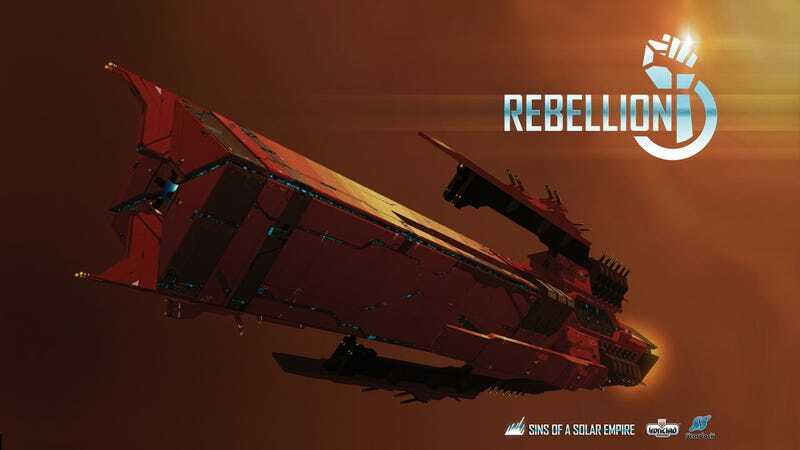 Sins of the Solar Empire: Rebellion is newly announced at GDC 2011, where several of Kotaku's finest are currently converging for a week filled with spectacular video game news.